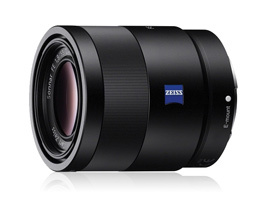 The Zeiss Sonnar T* FE 55mm f1.8 ZA was one of five new lenses launched alongside Sony’s full-frame mirrorless 36-Mpix Alpha 7R and 24-Mpix Alpha 7. It’s a premium model weighing 9.9 oz (281g) and adopting a dust and moisture resistant construction and metal outer shell. However the optical construction consisting of 7 elements arranged in 5 groups is relatively simple and in keeping with the Zeiss Sonnar lens design. With no distance markings or depth of field scale and a minimum focusing distance of 1.6 ft. (0.5m), it all seems rather modest for a shade under $1,000. 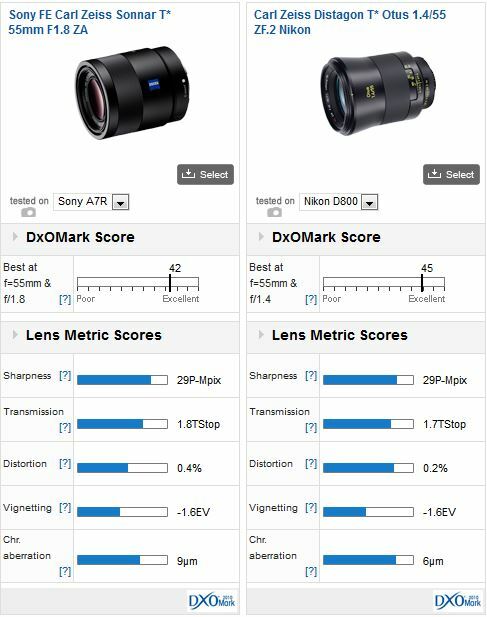 However, the Zeiss badge on the side shows great promise with regard to image quality, especially when paired with A7R that, with its 36-Mpix sensor sans AA filter, is practically identical to imaging device found on the Nikon D800E. 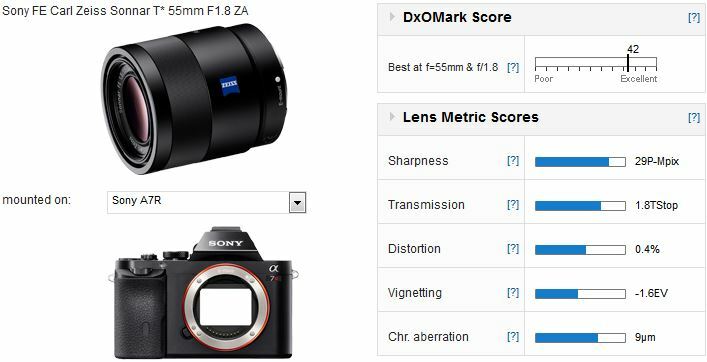 Achieving a DxOMark lens score of 42 points the Zeiss can claim one of the best scores for image quality in our database, and not far off that achieved by the $4,000 Zeiss Distagon Otus 55mm f1.4 mounted on a D800. 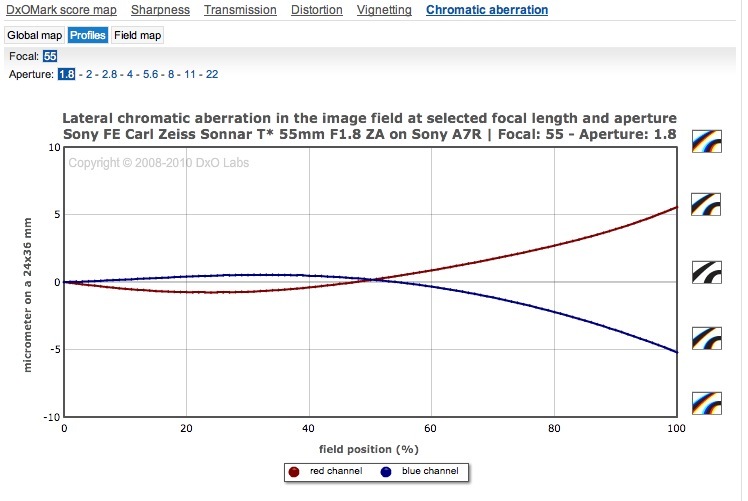 In fact, the Zeiss Sonnar has similarly high peak sharpness and outstanding uniformity with less than 5% loss in sharpness across the field at any given aperture value. Even at f11 the acutance remains extremely high (at around 70%) with less than 1% deviation across the image frame. In fact horizontal and vertical acutance measurements only vary slightly, which shows very good correction of astigmatism (and should produce very natural looking out of focus blur). Transmission is outstanding but while both distortion and chromatic aberration are quite well controlled, some slight CA is evident throughout the aperture range though it decreases when stopping down. While the Zeiss Sonnar 55mm f1.8 performs extraordinarily well, there’s some slight CA evident towards the corners. We were impressed with Zeiss Distagon T* Otus 1,4/55 recently and although it’s a retrofocus design for DSLRs it’s the best performing model we’ve tested to date. The new Zeiss Sonnar T* 55mm f1.8 comes very close to the IQ of the Otus. Peak sharpness is close (bearing in mind the Nikon D800 has an AA filter while the A7R does not) though the two perform differently with the Otus being optimized for greater sharpness at wider apertures. As you might expect at the price, the Otus is slightly better corrected for distortion and chromatic aberration. And while it may appear the two have similar levels of vignetting, at f1.8 the Otus has lower levels with disappearing more or less by f2.8. Whereas, the Sonnar never really clears it up. On paper at least the Zeiss Sonnar T* FE 55mm f1.8 ZA may seem somewhat unadventurous and over-priced given the f1.8 maximum aperture. In reality the lens is a bright 1.8TStops, and image quality is outstanding. Even the $1,000 price seems quite reasonable. If you wanted an Otus 55mm f1.4 and Nikon D800 but couldn’t stretch to it, you could do a lot worse than buying an A7R and the Zeiss Sonnar 55mm f1.8 ZA.